Ask fellow campers about "Homestead by the River" and nearby attractions. We enjoyed our time at this campground. 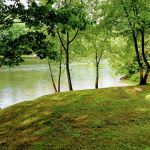 The campground is on the Saco River and has a variety of campsites including many seasonal sites, grassy water/electric sites, FHU back-in sites, and a number of tent sites near the river. We opted for a 30 amp, FHU spot and really liked it. Our site was spacious and bordered by evergreens on both sides, providing a nice level of privacy. The campground has several farm animals, including horses, and a large children's play area. There's a nice swimming area on the river that got a lot of use over the weekend. The campground wasn't cheap, but compared to many in the area it was as good or better than most. 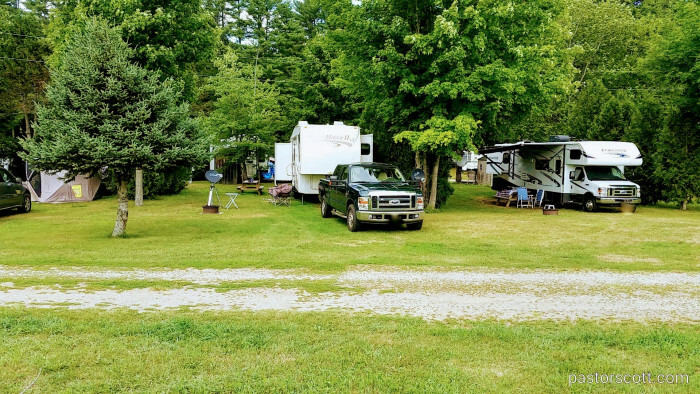 We think Homestead is a nice campground and we recommend it to those looking for a spot in the area. We camped at Homestead by the River in a Fifth Wheel. We enjoyed the lighthouses south of Portland. Once again, a wonderful experience. Friendly, welcoming staff. Grandchild loved the play area and the farm animals. We even tried fishing on the Saco River. Too bad there are not more reasonably priced and well managed facilities like Homestead! We camped at Homestead by the River in a Motorhome. 1/2 hour to Portland. 10 minutes to Old Orchard beach. Stayed for 2 nights, than came back a week later for 2 more. Beautiful farm setting with acres of field view from site, horses, sheep, lama, goats, & fresh eggs available from their chickens. Quiet with great privacy & full hook ups. Great place for kids! Surrounded by the Saco river. We camped at Homestead by the River in a Travel Trailer. Portland only about 17 miles away with plenty of great restaurants, nightlife, harbor views. Parking is difficult. $10 ~15 for the evening. We had pull through site in a shaded mowed grass area. The site had water and power but only a dump station. I would have rated this higher had it had FHU. Local TV worked well as did the Wi-Fi. The lady who checked us in was very pleasant and helpful. 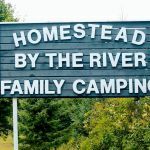 We camped at Homestead by the River in a Travel Trailer. Relaxing, convenient, friendly campground. Horses, llamas, ducks and goats to entertain and amuse. Far enough from tourist areas to provide peace and quiet but near enough to allow easy access to Portland, Wells, Kennebunkport, and more. Owners are very friendly and helpful and sites are level, spacious and private. One of the best places we stayed on our trip. We camped at Homestead by the River in a Fifth Wheel. Ask the owners for recommendations on restaurants and attractions. What a great campground! Very small and quiet place, quite unlike the busy places in nearby Old Orchard Beach. Sites are large, shady, and grassy. 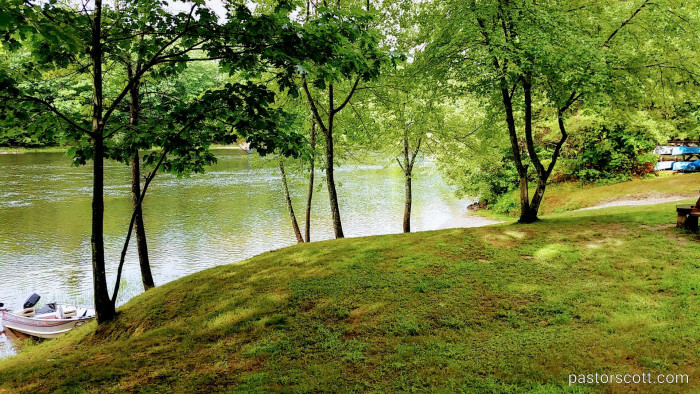 Campground is on the beautiful Saco River. Wifi was nonexistent at our site, but I saw people on laptops sitting on benches outside the office. Extra $4/day if you want to use your AC. We camped at Homestead by the River in a Motorhome. A nice park with a lot of permanent residents. But it kept up very well. When we first arrived we only had water & electricity. At this site we had excellent phone & wifi. We moved to a new site the next day that we loved because we had full hookups. But, our phone service was sketchy & we had no wifi at all. So, we'd go down by the office to use our computers. When we had service it was excellent. I've seen much better laundrys but got it done. We would stay here again if ever in the area again. We camped at Homestead by the River in a Motorhome. We really loved this campground. It was just as the name states, homestead. The owners were very friendly and helped us with directions and local eating establishments. The only reason I didn't give the a 10 is that we could not get internet except right in front of the office. Campground was very nice and neat. We stayed 6 nights and it was very peaceful. I would return again. We camped at Homestead by the River in a Fifth Wheel. It is a very nice, average size, neat campground. It appears to have a lot of seasonals, but most looked taken care of. No one was there during the week. We stayed around the back and to the right. Our site was large, full hook up, quiet and very scenic. We faced a huge open field bordered by pines, and to our right was a barn and several horses grazing behind the fences. There were other animals and just pleasant to walk around and see everything. Appeared to have a nice play area for the kids. The woman owner was very pleasant and helpful. Not sure about cable. Our internet worked perfect on our ipads. Would definitely stay here again. We camped at Homestead by the River in a Motorhome. Wow, what a nice find. The name really describes this place to a T. We co-hosted a small Rally of 8 Bounders here and everyone was impressed with the place. Very quiet and peaceful here. Most of us were in the huge pull through grass sites with 50 amps and water. Even with heavy downpours on two days we had no trouble with getting out. Might be an issue after really intense rain. Hookups are side by side, but we all had so much room between us that it was a non issue. TV via batwing and Verizon cell and broadband were both very good. This is a very good value compared to what the parks closer to the ocean charge. We paid $30 plus tax for our sites. We will definitely be back again. We camped at Homestead by the River in a Motorhome. 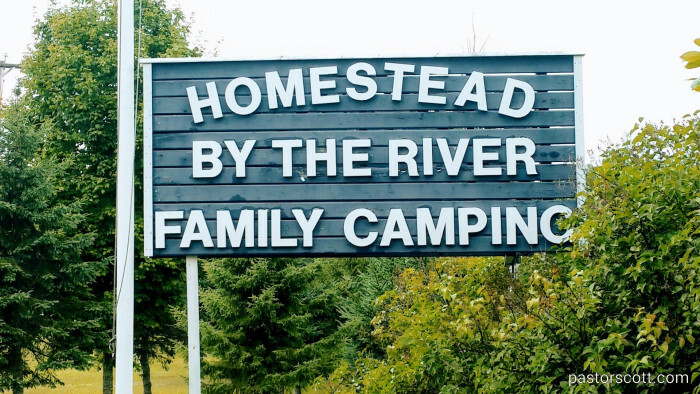 Homestead by the River stresses that they are a family campground. I have been to many campground where it is loud all night with people drinking, laughing, yelling and yes fighting and swearing. You will not find that here. One of my daughters hates camping and she loved it and wanted to stay another night and asked to come back next year. We were thrilled. She learned to ride her bike at this campground. I saw one person who drove above the speed limit and noticeably a bit reckless and she was a young girl. The team of husband, wife and father run a tight ship which for the camper who wants to get away and have peace and quiet this place is a 10. The sites are spacious, clean (no cigarette butts, and yes my husband is a smoker) and you won't find dog waste everywhere or trash. People respect the natural surroundings. The farm is wonderful for the kids and the employees could not be any more helpful and accommodating. My family will be going back next year. We camped at Homestead by the River in a Tent Trailer. Park is owned by a very nice couple who are working hard to clean it up from the previous owner. There are horses, llamas, sheep, ducks and chickens. We really enjoyed our stay and would definitely stay there again. It is a family oriented park. We camped at Homestead by the River in a Motorhome. This is a very quaint, quiet campground. The staff was very helpful and friendly. What we liked most was that our dog could swim all day in the river and no one bothered us. We camped there with friends and we were able to pull up next to each other awning to awning. All in all it was a great place for us. 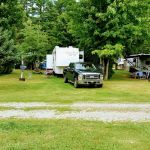 We camped at Homestead by the River in a Fifth Wheel. Has a small arm gate for "security" operated from the office/camp store that, if someone wanted to, could be bypassed by driving around the barn before the gate. We got a kick out of the British flag flying under the American Flag on a pole next to the office. Alot of seasonals. No discounts of any kind on rates. A dumpster along the entrance road where they dump the animal waste with many flies buzzing about. We paid the 31.75 and set up. Since the coach was hot from travel and we had 4 dogs with us I asked if I could run the air for an hour to cool it down. I could, but it cost me another 3 dollars extra. I paid the 3 and went to the RV to get changed. I left the door open to get cooler air until the ac had a chance to start working, then changed into a pair of shorts. I had just finished pulling on my shorts when there was a knock at the door. The lady that owned the campground was upset that the door was open and the AC was on and we were wasting electricity (That I had paid extra for). After that fiasco, things went smoothly and we had a quiet pleasnt night. Loads of goats, chickens and horses around. It was a clean and neat campground but I would not go back. We camped at Homestead by the River in a Motorhome. Are you affiliated with Homestead by the River ?